What I like most about Spyderco knives is their quality and craftsmanship… whether it’s great fit and finish, good steel, thoughtful designs, or many others, it eventually comes down to the fine cross section between quality and value. Having first been exposed to the higher end Spyderco knives (i.e. the Spyderco Sage 1), I was initially hesitant to pick one of their “value folder” series. 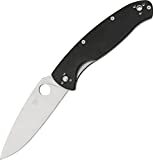 These include the best known Spyderco Tenacious, the Tenacious’s little sibling, the Persistence, and the big brother, the Spyderco Resilience. I am so glad I gave this knife a chance… The Resilience has turned out to be one of my favorite knives. You know how you can tell you really like something? It’s the thing you pick up to check out, and realize you never set it down. The Resilience makes a very handy everyday utility knife for jobs that don’t call for an actual fixed blade. Don’t go batonning with it, but aside from that, this is one solid, reliable folder. And it makes an excellent very full size EDC folder (“laws” in your area permitting), and it’s just a very handy everyday utility knife. Really this huge blade pairs nicely with a tiny folder, such as the most excellent Spyderco Ladybug which just disappears in your pocket until you need it. Pictured below is a Resilience, alongside a Spyderco Ladybug and the most excellent and ultra portable FourSevens Mini ML flashlight (review coming soon). The Resilience just feels very good in the hand… very solid, the G10 scales are grippy but not harsh enough to tear up your pants. And the G10 handle material provides good, solid in both dry and wet conditions. So… how does it carry? Surprisingly well for such a large, solid knife, with stainless steel liners. At 5oz, this is not a “light” folder. But given the solid feel and 4.25 inch blade, you’re getting serious value for that weight. This knife is one of the very few Spyderco models produced in China. Not really a problem, but some people take issue with this. In addition, the blade is made of 8Cr13MoV stainless steel, which is not considered a “great steel”, i.e. on par with or just below AUS8. That just means edge retention and corrosion prevention won’t be up to par with a comparable $100 Spyderco knife, but then you probably already figured that. I don’t see either one as real issue, considering the value you’re getting. Let’s remember we’re looking at a VALUE folder here, roughly $42 delivered at the time of this writing. You could get a U.S. or Japan made Spyderco folder of similar dimensions and utility forged from higher quality steel for just over$100. Or you could get yourself a Resilience, and see if it does the job for you. And here are some pictures of my Resilience sitting around posing… next to a Spyderco Sage 1, a Spyderco Ladybug, and yes, even next to another Spderco Resilience. At $42 delivered, this knife is an amazing value for its quality and features. Don’t hesitate, just get one. You can send it back if you don’t like it, but what’s likely going to happen is you’ll also get yourself the smaller sibling, the Spyderco Tenacious. If you’re looking for a knife the size of the Resilience, but designed and produced to a higher quality level, I strongly recommend the Spyderco Military. 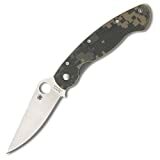 The Military is one of Spyderco’s most well known and respected knives, and one of my personal favorites. It’s on the very, very short list of knives I’d pick if I could have only a couple. Yes, the Spyderco Military is significantly more expensive than the Resilience… but as with most things, you get what you pay for. Hold a Military for yourself and you’ll see what I mean.